The Core XE variants of this year's Intel chipset lineup have been announced, but are not available yet. The top flight of this series, the i9-9980XE, is the subject of an apparent leak. It consists of a 3DMark Time Spy score for the processor. The Core i9-9980XE is the flagship of Intel's latest HEDT processor line-up. It has 18 cores and 36 threads, which does not distinguish it from its predecessor, the i9-7980XE. However, with its improved clock speed of 3.0 GHz (base) or 4.5 GHz (single-core boost) clock, it is expected to be more worthwhile than the previous chipset. The i9-9980XE also has improved thermal management: for example, its TDP is now 165W. A new leak alleges that this processor has been tested on 3DMark Time Spy. Its results were posted as an app-linked Tweet by the tipster TUM_APISAK. It claims a total score of 9.362 on this benchmark. This is made up of 10,728 for the CPU and 9,157 for the graphics. This score sounds impressive. However, it is also not a huge improvement over the i9-7980XE in a direct comparison using the same test. 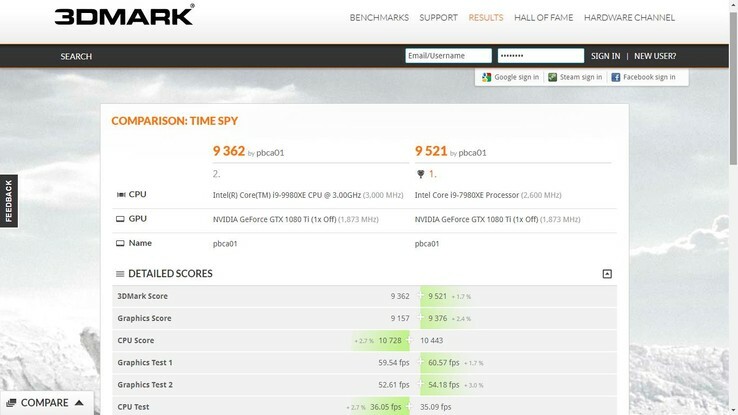 When we found the Time Spy scores from the same 3DMark user (pbca01) associated with the 'i9-9980XE leak' scores, it was apparent that its predecessor had slightly outdone it. The i9-7980XE returned a score of 9,521 in Time Spy. Even though it did a little worse (10,443) in the CPU tests, it achieved more frames per second (fps) in the GPU tests, and scored under 1 point less in the CPU fps sub-test. These results were associated with the exact same graphics card (one 1,873MHz NVIDIA GeForce GTX 1080 Ti) on the exact same ASUS ROG motherboard with the exact same Samsung SSD. Oddly, both tests were also conducted on the same day (October 25, 2018). Therefore, should this leak prove true, it appears there is little significant difference between the two chipsets. On the other hand, there are more extensive benchmarks with other important metrics in which the i9-9980XE is yet to be officially listed out there. It will be up to the individual buyer whether the CPU boost in this newer chipset is worth their money.